When you’re out hunting, it pays to stay sharp. And not just mentally. Razor-sharp broadheads significantly increase your chances of success. They fly straighter, penetrate deeper and stay on course when cutting. Learn to sharpen them yourself, and you’ll always be prepared for an effective shot. If you’ve never sharpened your own blades before, it’s easy to learn how. We’ve prepared a simple guide below along with video, so you’ll be on your way in no time. We also have our four favorite sharpening systems listed with all their features. There’s a great pick for every situation. Checkout these links if you want to see our top rated mechanical or fixed-blade broadheads. How do you sharpen broadheads anyway? The basic principle behind sharpening broadheads is the same as any other blades like knives or axes. The sharpening surface shaves away small amounts of metal at an angle leaving the edge of the blade thinner and thinner. Broadheads can be a bit more work to sharpen because of their small size, but with the right system, it’s a simple process. You want to push each side of each blade across whatever your system’s sharpening surface is. Three-blade broadheads are the easiest to sharpen because the triangular organization keeps the blades at a uniform angle. You can hold the broadheads with one blade to push another across the sharpening surface. You should usually do about ten strokes before changing the surface. If your system comes with multiple surfaces, you should start with the coarsest grain and continue through the finer grains. It’s a good idea to mark each side of each blade with a Sharpie. When you sharpen one side of the blade, it will remove the Sharpie. This way you can keep track of what you’ve done. Different sharpening systems use different surfaces. Stones are especially common. This could mean artificial stones designed with diamond grit or ceramic or natural stones usually formed of quartz. Different stones are better for different things, so we’ve made sure all of our picks are good for broadheads. Mechanical sharpeners employ more than just a sharpening surface. They use intricate devices to sharpen the blades that decrease the amount of force and precision you have to use yourself. For example, cutters might be attached to bolts that can rotate. They have obvious advantages. They sharpen at consistent angles, and they’re much easier to use. They aren’t usually as versatile, though. 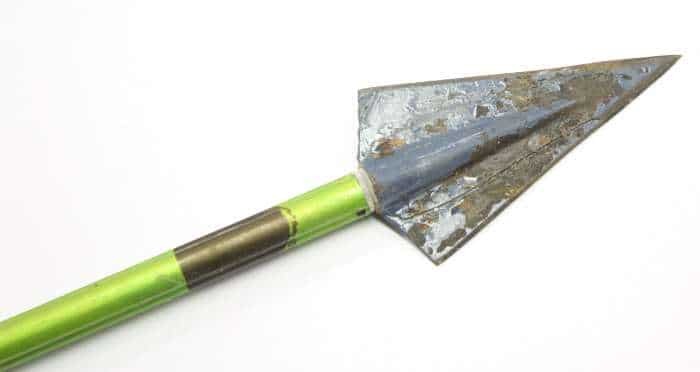 Most can only be used for broadheads, so if you want something that can work on your hunting knife as well, go old school. As we mentioned, two- and four-blade broadheads can be a little trickier to sharpen than three blades. That’s because there’s no convenient way to hold them to get a consistent angle. For both, we suggest a clamp to hold the arrows. Some systems even have guides to maintain the angle. You can also find smaller sharpeners that can work while the broadhead is still on the arrow. These are another great option. 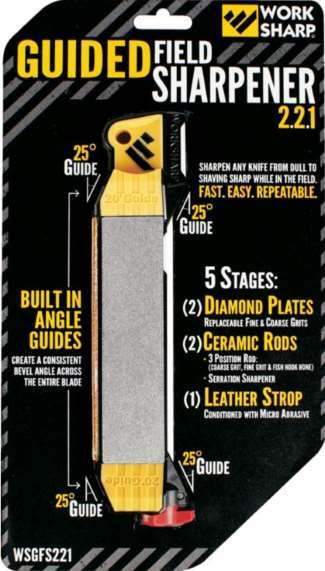 Of course you need something to sharpen your broadheads. If you’re an experienced hunter, though, you know there are quite a few other things you need to sharpen as well. That’s why we’ve put this sharpener at the top of our list. It’s versatile and can be used on just about any blade. That could mean your knife or axe. It could even mean hooks when you go fishing in the summer. That’s not all we like, though. It’s also highly portable. You can easily pack it to take it on your hunts with you. Sure, you should probably sharpen your broadheads beforehand, but you never know when you might notice a blade you missed. Plus, you might want to sharpen your hunting knife before you field dress your quarry. You might even just want something to do up in your stand. Adding to the portability, this sharpener is a self-contained unit, so it’s nice and compact. That also means there’s no setup which makes it extra convenient. There’s even an integrated broadhead wrench. Last but not least, this is a quality system that sharpens blades in five stages. It has two diamond plates, one coarse and one fine, a ceramic rod with fine and coarse grit, and a leather strop. All this even comes at a low price. There’s no doubt about it, the KME Knife Sharpener System is a high-end product. That means a high-end price tag, but you definitely get what you pay for and more. This system gets detailed with sharpening. It comes with four Gold Series KME 1×4 diamond hones, all of different grains: extra coarse, coarse, fine and extra fine. This means you can sharpen your broadheads or hunting knife down to razor sharp. Even though this product seems like it’s made for professionals, it’s actually pretty easy to use. In fact, it’s a guided system. There’s a spherical bearing rod guide that keeps you from deviating from the angle. This gives you a smooth sharpening motion and keeps the blades uniform. This is especially important for broadheads since deviations can mean movements in the air or in flesh. It also includes a base and mount which along with the clamp let you sharpen without holding the blade at all. These and the numerous other accessories all fit inside a portable hard carrying case that keeps it all organized and safe. If you’re a serious enthusiast who wants to keep your broadheads gleaming sharp as well as your knives, this is a top-quality choice. We recommend this sharpener if you’re using two- or four-blade broadheads. That’s because the universal wrench fits any broadhead. It lets you conveniently and safely remove whatever kind of broadhead you use, even those rare five-bladed ones. It also has a low-V tungsten carbide sharpener. For one, this allows you to sharpen two blades at once, saving you time. Even better, you can sharpen your broadheads while they’re attached to the arrow because you can apply the force to the sharpener itself. The downside of this is that the sharpening surface doesn’t last as long as bigger, longer stones, but it’s plenty for the super low price it comes at. The sharpener and wrench combo has a rubber overmolded grip. That makes it easier to apply force. Ultimately it only takes a few strokes to adequately sharpen your blades. The Lansky Sharpener is small and compact, so you can actually take it on your hunts with you. It even comes in hunter orange. Since you can easily use it while the broadheads are attached to the arrows, this is a good portable sharpener to keep in your pack. Here’s a link to a video where Kevy’s RC & Music demonstrates why the Lansky Broadhead is so effective. As an Arkansas native myself, I might be a little bit biased, but it’s hard to beat natural novaculite stones straight from the Ouachita Mountains. There’s a reason they’ve been the traditional go-to for blade sharpening. Arkansas stones have a lot of versatility. They’re 1,000-1,200 grit, so they work on pocket knives, hunting knives and, of course, your precious broadheads. They remove an ideal amount of metal to polish your blades up razor sharp. The Smith’s stone specifically is mounted on a molded plastic base. This gives it traction on the counter or table, so keeping it still to get a consistent angle is easy. It also makes it easier to hold if you apply water to the stone, which is the usual method. It’s four inches long, so you can put it in your pocket and take it to your tree stand or wherever else. It’s a quality product made in USA.